Hurricane Harvey may be on its last days in Texas, but the state — particularly Houston — has a long road to recovery ahead. Tropical Storm Harvey may be on its way out of Texas, but the state — particularly Houston — has a long road to recovery ahead. The number of activated National Guard members for Harvey relief efforts has increased from 12,000 to 14,000. Abbott also mentioned Texas is expecting up to 10,000 more members from other states. More than 32,000 people in the state are in shelters, and around 5,000 evacuees are currently residing in state parks. Texas DPS has deployed more than 2,000 workers to targeted regions in the state so far. Around 210,000 in the state have registered for federal assistance. The Federal Emergency Management Agency has already provided more than 5 million meals. Asked about the state’s “sanctuary cities” law that’s set to take effect Friday, Abbott said people at evacuation shelters and those seeking other help won’t be asked about their immigration status. “We’re here for one purpose — to save people and help the people who are here,” he said. According to a preliminary estimate from AccuWeather, experts predict Harvey may be the costliest natural disaster in U.S. history, with a price tag of roughly $160 billion. “This will be the worst natural disaster in American history. The economy’s impact, by the time its total destruction is completed, will approach $160 billion, which is similar to the combined effect of Hurricanes Katrina and Sandy,” Dr. Joel N. Myers, founder, president and chairman of AccuWeather, said in a statement. A presidential disaster declaration now includes more than 30 counties. Houston Mayor Sylvester Turner announced Tuesday evening that he was issuing a mandatory midnight to 5 a.m. curfew on the city "to prevent potential criminal acts." But many Texans are still worried about what lies ahead. In what appeared to be a response to some critics' suggestions that Houston’s lax land development and zoning policies contributed to the disastrous flooding, Turner took to Twitter on Wednesday. A joint investigation by The Texas Tribune and ProPublica last year found that unchecked development in Houston — the nation's fourth-largest city that's home to more than 2.3 million people — has made the area unprepared for the next big rainstorm, while increasing flood risks for residents. Also on Tuesday, U.S. Environmental Protection Agency Administrator Scott Pruitt met with local and state leaders in Corpus Christi to assess Harvey recovery efforts. "As I saw firsthand today, the Lone Star State has shown commendable perseverance in helping their fellow neighbors through this crisis," he said in a statement after his visit. "EPA is committed to working with our federal, state and local leaders to provide relief to the affected regions." In the days following the storm, multiple deaths have been confirmed. According to the New York Times, since Friday, 30 people have been killed as a result of the storm. This morning, the Associated Press reported that authorities had found a shivering 18-month-old toddler clinging to the body of her drowned mother in Southeast Texas. Officials say the woman was trying to carry her daughter to safety when flood waters swept them both away. The toddler is now in stable condition at a Houston hospital. The Texas Department of Transportation is updating its website daily on driving conditions throughout the Houston area. According to its most recent update, “some previously flooded roadways in Southeast Texas have reopened [but] additional ones are currently experiencing flood conditions and there remain over 500 Texas roadways experiencing flooding.” The agency added that travel is not advised in the affected areas due to rapidly changing water levels and unsafe driving conditions. These are the roads closed in Houston today, according to the Houston Chronicle. On Wednesday, the U.S. Department of Health & Human Services declared Texas and Louisiana a "public health emergency." As of this morning, the Texas Department of State Health Services had relocated 956 patients from hospitals and nursing homes in the areas affected by Harvey. Aside from transporting patients, the department has also taken medical units to shelters and set up medical shelters for people who need basic health support but don't need to be hospitalized. There have been more than 50 inches of rain recorded over the past few days — but that may be stopping soon. Even if the rain does stop, the storm isn’t over. Rivers and bayous are continuing to rise and levees are at risk for breaches and failures. “Parts of Houston, the United States' fourth-largest city, will be uninhabitable for weeks and possibly months due to water damage, mold, disease-ridden water and all that will follow this 1,000-year flood,” Myers said. Hurricane Harvey was previously described by the Federal Emergency Management Agency as “one of the worst disasters in Texas history.” Now, Harvey is showing signs of leaving the Texas coast and made landfall earlier this morning in southwest Louisiana. Even after the storm leaves Texas, however, Houston will have ways to go before its returns back to its normal state. 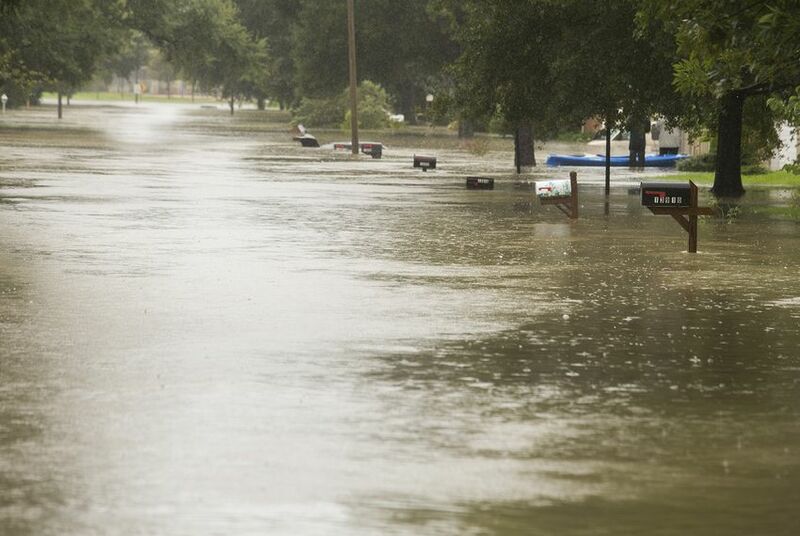 Up to 30 percent of Harris County — which is home to 4.5 million people — is underwater, ABC News tweeted this morning. They added that this is the equivalent of New York City and Chicago combined. Storm Front Weather tweeted this morning that Port Arthur and Beaumont are both facing catastrophic flooding. The National Weather Service has also issued flash flood warnings for Southeast Texas, Harris County, Jefferson County and Galveston County, among others. The NWS is keeping an updated list of counties under flash flood warning on its website. Homes worst hit by Harvey may wait months for power to come back, Bloomberg notes. Even after the city has finished repairing damaged power lines, electricians have to certify flooded homes before they’re able to reinstate service. It’s also likely that Houstonians will see their property values drop — even by as much as 60 percent — over the next few years. The Texas Department of Public Safety has received reports about initial damage from Harvey from 66 cities and counties. In Harris County alone, more than 40,000 homes were affected by the storm and roughly 750 were destroyed. Despite the heavy rainfall, Houston is slowly getting back on its feet. The city's two airports plan to resume limited domestic airline passenger service Wednesday afternoon, the airports' operating agency announced in a Facebook post. According to the post, both airports will attempt to begin a phrased return to service and full service is expected by this weekend. In addition, several Texas officials have made statements letting Houstonians know that despite the heavy rains and severe casualties, there are several resources available to storm victims. On Tuesday evening, the Texas Supreme Court issued an order allowing out-of-state lawyers assist Harvey victims. This morning, the City of Houston Office of Emergency Management tweeted that it had received an overwhelming amount of support from people offering their boats for rescue. "Thx to them, we have all the assets we need," the tweet read. The Houston Independent School district announced Wednesday it had received approval from the U.S. Department of Agriculture and the Texas Department of Agriculture to give all HISD students free school meals during the 2017-18 school year. "The flooding that is affecting the city of Houston has been devastating for many. Some of the areas that are the hardest hit are filled with working parents whose limited funds will need to go toward recovery efforts," Houston ISD Superintendent Richard Carranza said in a statement. "This waiver will give our families one less concern as they begin the process of restoring their lives." In a press release Wednesday, FEMA said that more than 12,400 employees from more than 17 federal departments and agencies are working together to support the ongoing response to damages resulting from Harvey. More than 63,000 individuals and households had been approved for FEMA assistance, the release said. Texas Agriculture Commissioner Sid Miller announced Wednesday that he had received permission from the federal government to allow schools in areas affected by Harvey to provide meals to students at no cost for the entire month of September. Students who had to evacuate their homes due to flooding or storm damage will also be eligible for the free meals. According to a news release sent by Miller, more than 1.3 million students will be eligible to get their meals at no cost. Conditions outside the South Texas Project Electric Generating Station — one of the state’s two nuclear power plants — were improving Wednesday, a Nuclear Regulatory Commission spokesman said, adding that nothing presented a safety threat at the site, which is about 10 miles north of Matagorda Bay. “There has been no water intrusion at the South Texas site. They continue to operate at full power, and we’re maintaining round the clock presence with two inspectors that are there,” said Victor Dricks, a spokesman for the commission’s regional office in Arlington.